We began our Christmas holiday adventure with 48 hours in Hanoi and we all almost instantly fell under the spell of this city… As if by magic, you don’t want to do anything, except maybe drink cocktails and drift off the map. Even the kids felt it. The city has the most intoxicatingly elegant decrepitude. Wonderful old buildings constructed by the French are in the most alarming state of disrepair… the Old Quarter is full of potential; French restaurants and Americans who look like they’ve been drinking since the war. You can see why people never leave. I am already longing to go back. Next we headed to Vientiane, the capital of Laos. It reminded me a lot of Thailand: Buddhists temples and poorly dressed back packers. And great food. Much to our surprise the food in Laos is amazing and way better than what we had in Hanoi. 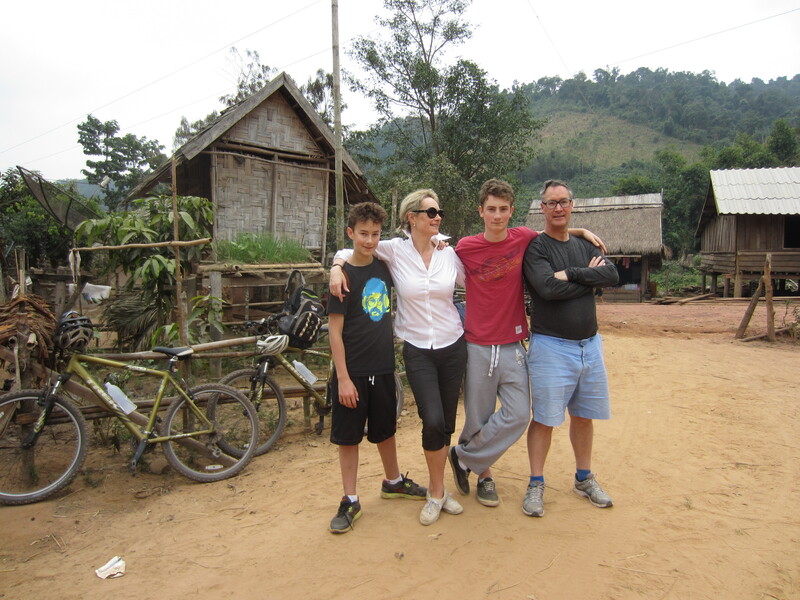 After another 48 hours, we headed off the beaten track and flew north to small town called Oudomxay. We were the only foreigners on the flight. We then hopped in a jeep and drove for 2 ½ hours over a shockingly bad road to a small village where we spent the night in a typical Kamu dwelling. The village has no electricity, minimal running water (no hot) and no cell reception. Everyone stared at us, pointed and giggled! 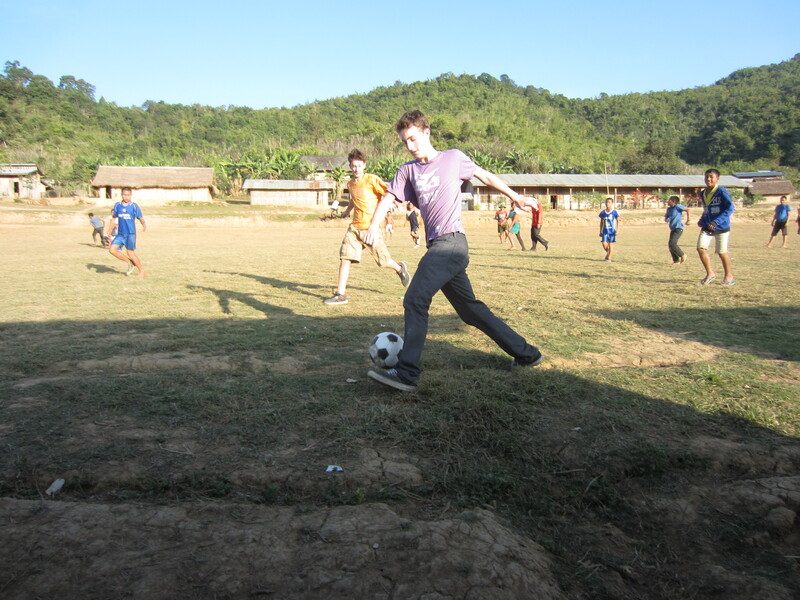 Until we headed to the school and the boys started playing soccer in the local schoolyard. Three hours later we were all friends! This village is extremely poor, and yet at 8:30 pm a generator went on and connected to a huge satellite dish; the sounds of bad TV flooded the air (yes, you can tell its bad even if you don’t understand a word!). It was shockingly loud, but better than the techno music that it was drowning out… it didn’t stop until 1:30 am. I would have spent the money on insulation instead. Raman noodles for breakfast (they had also been dinner the night before as our guide forgot to organize meals) then we wandered across the rice fields and into the jungle… two miles later we arrived at the entrance to Chom Ong, an 18-mile long cave. We are currently about 100 km from the Chinese border and 150 km from the Vietnamese border. This part of Laos was one of the most heavily bombed places on earth. The Americans were trying to discourage the Vietnamese from fleeing the war. The people of our village have know about this cave for centuries and hid here to escape the saturation bombing. However, it was only surveyed in 2010 and has been open to tourists since 2007. It is so hard to get to, not many people come. It is also incredibly challenging to navigate. We laughed when they handed us hardhats with spot lights attached… a gimmick for the tourists we thought. They could not have been more necessary… we regularly smashed our heads as we crawled under, scrambled over and squeezed through stalactites and mites. We spent about 6 hours in the cave and only got about 2 km deep. It was amazing, beautiful, filthy and dark! My palms are raw. Today we went for a 25 km bike ride into the hills past some of the most picturesque scenery I have witnessed. 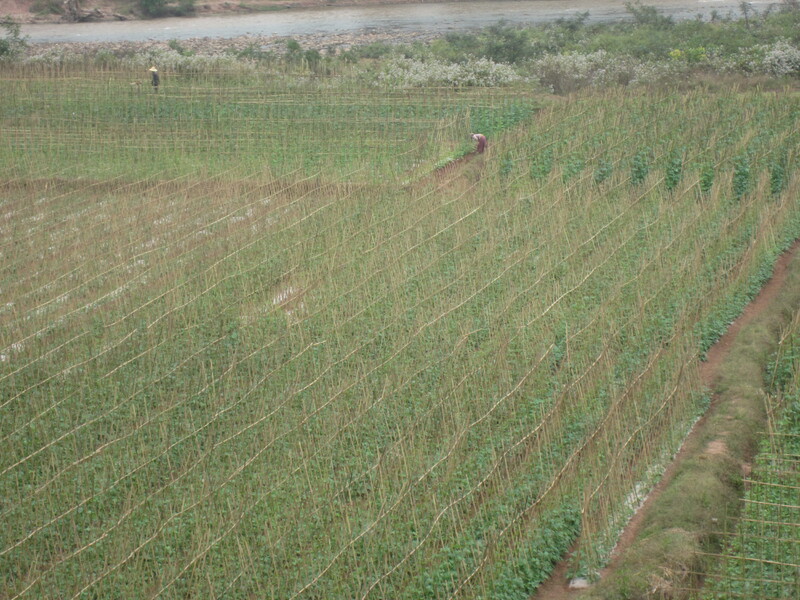 We helped plant peanuts, had a great picnic along the river and I tried carrying one of the 40 kilo sacks of rice the women lug for a kilometer from the fields to the village. I could barely manage 20 feet. I worry that god is punishing me giving me two such active boys. The ride was up and down through the mountains. I found going down terrifying and up was simply impossible. I got further and further behind, arriving back at our hotel an hour after the boys, so sore I could hardly my leg over the bike. Only to face the indignity of Hunter telling me I look funny when I ride! However, as Jack said when we had to push the jeep to get it started, “it’s all part of the adventure!